UKIYO-E: "Pictures of the floating world." The floating world - a transient realm of pleasures, horrors, and dreams. Ukiyo-e, depictions of this shadowy projection of the human mind, formed the mainstay of Japanese paintings and woodblock prints produced between the 17th and 20th centuries. 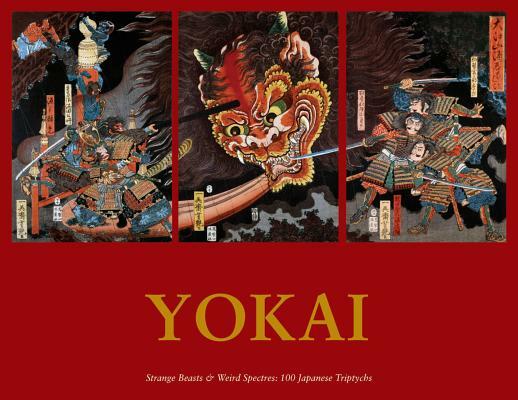 YOKAI: "Ghost; apparition; phantom; spectre; demon; monster; goblin." Taking this definition to include mystic visions and mythic or monstrous beasts, this book collects more than one hundred 19th century Japanese woodblock prints whose subject matter covers the entire spectrum of the supernatural and the outlandish. The selection of works is also limited to the triptych format, which gave ukiyo-e artists the freedom to express their phantasies as narratives in a kinetic, detailed image frame. The work of over twenty different artists is featured, spread over five different categories - kaiju ("strange beasts"), yurei ("ghosts"), oni ("demons"), juryoku ("mystic forces"), and yojutsu ("black magic"). The book also has a special section for yakusha-e, prints directly depicting supernatural scenes from the kabuki theatre.